Movistar launches new service location in the cell that incorporates GPS technology. Movistar Peru, launched its first service location that incorporates the most advanced system available location in the world market, the GPS technology. 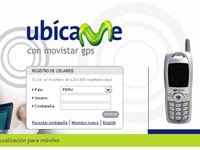 Movistar ubicame allows real-time location using GPS satellites and CDMA 1x network to deliver results with high precision through the services for staff. Among the advantages of the new mobile service are: location in real time, better monitoring and greater control, high precision, using digitized maps, more flexibility, because the locations can be made from a cell phone or via web. Now, knowing where they are our loved ones or employees will no longer be a problem, there's no excuses for lack of signal in the cell.